Comment: Albertson crashed on the third lap of his second qualifying session at Anaheim 1 and caught his leg under the bike. He underwent ACL surgery in late January but has just been released to walk. Should be back on the bike in May and ready to race Hangtown. Comment: Rehabbing his foot and may be back for Seattle if all goes to plan. Comment: Still suffering the effects of a crash at the Pala National, where he compressed his back, causing a herniated disk. He will most likely miss all of the 2011 SX season but hopes to return to action at the start of the outdoors. Boni broke his tibia and fibula in Dallas. Comment: Fractured his femur and L4 and L5 vertebrae in a practice crash at Anaheim 2. “Doing a lot better,” Daniel told us. “Femur is healing up good. My back is slowly improving. Looking to hopefully be back by X games if everything goes OK.” In this video, Daniel discusses his crash, his injuries, and his future. Also, a PayPal account has been set up to help Daniel and his family. If you are in a position to donate, please click here. PJ Larsen suffered a broken wrist in Dallas and is expected to miss 6-8 weeks. Comment: The MotoConcepts rider has resumed light training and should be back on the bike in a few weeks. He'll return to racing most likely at Hangtown. Comment: Tore the patella tendon from the bone and had surgery to reattach. He was recently released by his doctor and is preparing for Seattle. 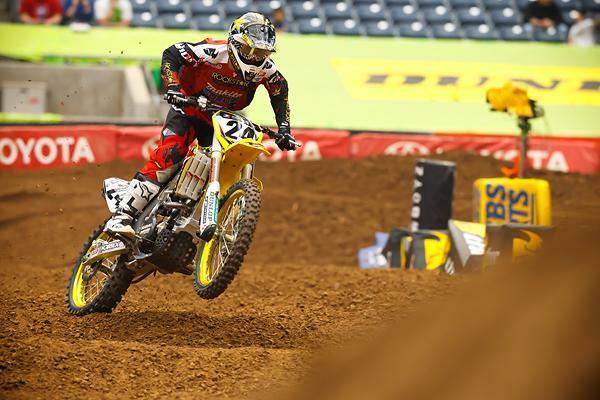 Comment: Broke his wrist during his heat race in Jacksonville and recently underwent surgery. Will be released in four weeks to get back on the bike. Comment: According to a TiLube Racing PR, Matt suffered serious injuries with a shattered left wrist and multiple fractures in his pelvis. He is out of the wheel chair and is now able to walk and should be back in about seven to eight weeks. 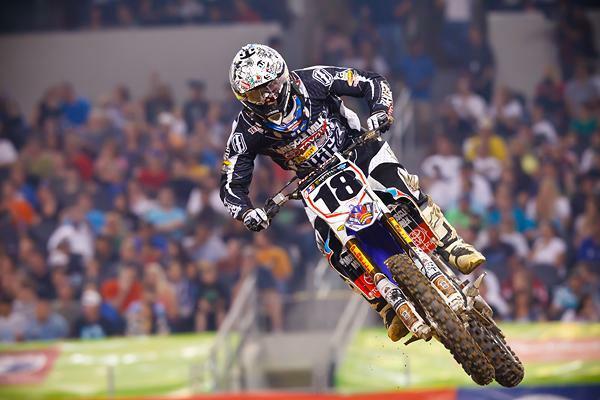 Millsaps is expected to race in St. Louis after a big get-off in Dallas. Comment: According to a statement released by Honda, Grant underwent additional surgery to his right knee to repair his anterior cruciate ligament (ACL), the result of an injury he sustained at the Phoenix SX. He anticipates a return to racing early in the summer. Comment: Crashed in qualifying at A1 and broke his ankle. Underwent surgery and hopes to be ready by Seattle. Comment: Broke his shoulder blade and is out indefinitely. Comment: Austin has three broken ribs and a bruised lung resulting form a practice crash at Anaheim 2. 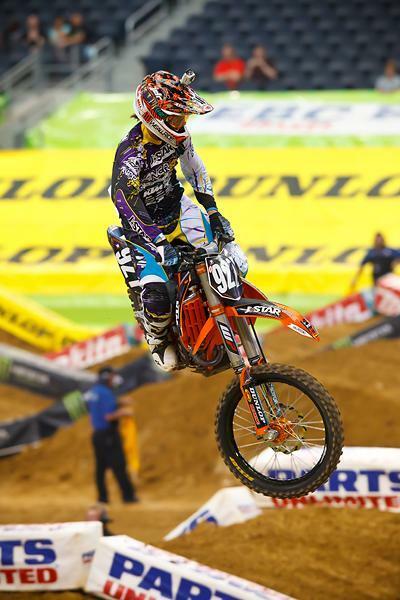 Shea Racing expects him to return at the Seattle SX. Comment: The Spokane, Washington, privateer broke his wrist just days prior to Anaheim 1 and is hoping to return to action in Seattle. Comment: Crashed practicing the Thursday prior to the Toronto SX. Had surgery and will probably be able to ride in four to six weeks. Plans to return at Hangtown. Comment: Broke his wrist days prior to A1. Rehabbing wrist and hopes to return at Seattle. 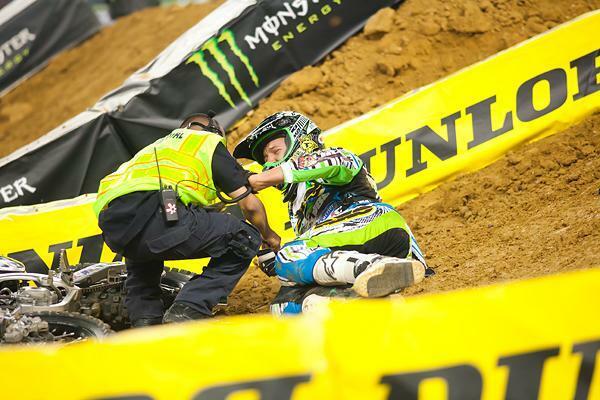 Metcalfe is still on the mend after crashes in Atlanta and Daytona. Comment: Still out from lingering affects of his crashes at Atlanta and Daytona. He is scheduled to return at Hangtown. Comment: Tevin was expected to debut for Shea Racing at Houston but broke and dislocated his wrist only days prior to the race. Hopes to return at Seattle. Comment: Crashed in practice at Daytona and suffered a head injury. Making progress—read the latest update here. Comment: Separated his left shoulder in San Diego, but he'll be back in action for Seattle. Comment: Fractured the scaphoid bone in his left wrist prior to the season and underwent surgery to repair. The bone graft was successful and Bryce has started light training. Plans to return at Hangtown. Comment: Crashed in Atlanta and reports are that he suffered a broken wrist, punctured and bruised lung, five broken ribs, broke a wing off of his spine, and a concussion. Did we miss someone? Email us at letters@racerxonline.com.